Sweet Potato Falafel Burgers combine two of my great food loves. It’s like if sweet potato and falafel had a baby. A bright orange, crunchy, delicious baby. These Sweet Potato Falafel Burgers were inspired by the incredible sandwiches at a local LA falafel spot called Fala Bar. With traffic, the closest location is nearly 45 minutes away from me (dang LA sprawl) so I had to learn to make my own. Luckily, this recipe comes together quickly, especially if you keep cooked sweet potato cubes in your fridge. I don’t always, but I’m realizing this is an excellent food to have on hand to add to salads and Buddha Bowls. A- sweet potato and falafel is a magical combination. B- keep cooked sweet potato on hand at all times. It tastes amazing in pancakes, smoothies, salads, quinoa dishes, the list goes on! If you use canned chickpeas, don’t forget to save the liquid! Aquafaba (aka the amazing bean water that I poured down the drain for years) can be whipped into meringue, used to coat and batter foods, and can replace eggs in baking dishes. We make the most incredible Pink Lemon Meringue Pie and Gluten-free Baja Tacos using aquafaba. We topped these Sweet Potato Falafel Burgers with homemade Parsley Hummus! The flavors are reeeeeeeally nice and the colors are super pretty to boot! Plus if you make your own hummus, you’ll have even more leftover aquafaba to play with. Healthy, hearty sweet potato falafel burgers that are delicious and easy to prepare. Top with parsley hummus, tahini, and hot sauce for maximum flavor! Preheat the oven to 425. Combine the sweet potato, chickpeas, and garlic in a food processor along with the dry spices, hot sauce, and maple syrup. Process until mostly smooth but still a bit chunky. Transfer to a mixing bowl. Add 1/2 cup bread crumbs and stir to combine. Form the mixture into four patties and coat each patty with the remaining breadcrumbs. Place the patties on a baking sheet lined with parchment paper. Bake for 25 minutes at 425, flipping the burgers half way through. Slice the ciabatta buns and toast lightly if desired. Build your burgers with suggested toppings or go wild and experiment with different flavor combinations! 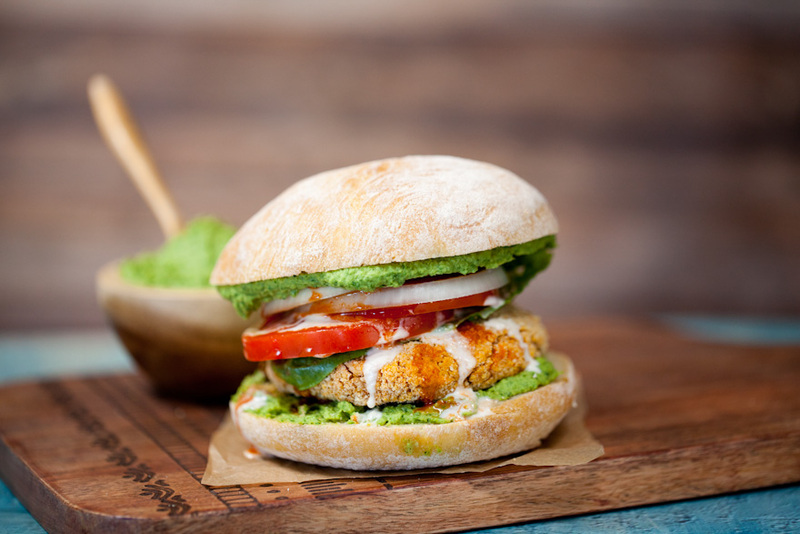 Use gluten-free ciabatta buns and bread crumbs to make this recipe gluten-free. Did you make these Sweet Potato Falafel Burgers? Leave us a comment below and tell us how it went! Better yet, post a photo to Instagram with the tag #carrotsandflowers 🙂 It makes us super happy when y’all do that! To see just how simple this recipe is, watch this video! We love connecting with you! Come say hi on Facebook, Instagram, Pinterest, and Twitter! To save this recipe for later, pin the photo below!